Raised on the East Side in both Boyle Heights and El Sereno, two adjacent East Side communities, Rodríguez Arago recalls her first job as a teenager. “I went to work at my uncle’s restaurant in Boyle Heights... La Serenata de Garibaldi,” she says. The restaurant, a mainstay on the high-end lists of recommended destinations for aficionados of upscale Mexican cuisine, was established in 1985 by her great-grandmother Isabel, her grand-uncle José Rodríguez and his wife Aurora. It was there, while busing tables after school, that a much younger Lydia Rodríguez Arago first conceived of her own catering company and gourmet kitchen. Her grandfather, acclaimed civil rights attorney and pioneering movimiento activist Antonio Rodríguez, is one of several other sons and one daughter born to Isabel H. Rodriguez, the family matriarch and immigrant from Mexico who brought with her not only an irresistible arsenal of recipes and expertise as a culinary artist but a passionate commitment to justice as a civic-minded advocate for the poor, downtrodden and oppressed working-class residents of the Boyle Heights community where she settled to raise her children and later helped a restaurant named for Plaza de Garibaldi, the famed century-old mariachi mecca in Mexico City. Following in her great-grandmother’s footsteps, Rodríguez Arago—as a young entrepreneur, single mother and a newly minted symbolic representative of a new generation’s drive, dreams and ambitions—has steadily begun carving out a space for her fledgling enterprise in the highly competitive food service industry. Her business model, says grandfather Antonio Rodriguez, is based on a limitless reservoir creative energy, ideas and vision. Relying solely on word of mouth referrals until now, Mi Pasión has been booked full-time for the last 52 consecutive weeks and is contracted as the official caterer of record for several major events through September of this year. An upcoming work order, for example, involves feeding approximately 400 people at a banquet. The booking, says Rodríguez Arago, came as the result of a “food tasting” she and Torres put together for executive staff at the organization hosting the banquet. Mi Pasión, she says quietly, almost reluctantly, was selected “over a major restaurant chain I can’t name. But you can imagine how it felt when they called to say that they had decided to go with us.” In the week immediately following the banquet, Lydia, Camron and their crew will prepare breakfast for 250 employees from the Office of the Federal Public Defender for the Central District of California. Camron J. Torres, Mi Pasión’s chief culinary artisan, possesses an instinctive ability best expressed in the kitchen through improvisational and inventive fusions and blends. Known as “CJ” to those in his circle, he attributes his gifts as a rising star among LA’s emerging “wunderkind” chef class to his grandmother, Coty Valdes, who gave him a solid foundation, when she imparted the secrets of Mexico City “sazón y sabor” over the delicious and succulent meals she made for him as a child. A protégé of master chefs at legendary LA-area eateries such as Bottega Louie, Café Pinot, Cita Pizzeria and Pez Cantina, where he practiced under the supervision of Chef Brett Thompson. Torres studied film production and recording arts at the Los Angeles Recording School and Cerritos College after high school. His exposure to the communications and the entertainment industries taught him that presentation and aesthetics matter. He now applies the principle to all of his plating, catering and culinary challenges. A growing number of fans and “gourmands”—those hard-to-please diners who approach every meal with the discerning palate of food critics—can attest to the special, highly personal flair he brings to Mexican, French, Italian and Mediterranean cuisines, particularly in the difficult and rigorous preparation of seafood. His latest hit, says Rodríguez Arago is the “Orgasmic Baja Taco,” a passionate Torres take on the traditional fish taco. 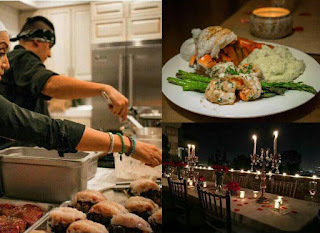 It has become a consistent favorite, she adds, among the options available to clients when they sit with Mi Pasión to plan the perfect culinary experience for their guests or employee at a group meeting, a company retreat, a wedding reception, a quinceañera or an on-location film shoot. In celebration of their growth and success, Rodríguez Arago and Torres are pleased to present the official “Mi Pasión Catering & Taquería” launch party, a red carpet extravaganza being held this week at the private El Sereno home shared by her grandfather and Mariana Herrera. Both avid Chicano art collectors, the couple are well-known for opening their Southwestern, adobe-style home and its tranquil outdoor terrace to community organizations and cause-related fundraisers. In this case, they are delighted to host the public debut of a business established by the young woman they adore. A limited number of tickets to the affair, says Rodriguez Arago, are being made available to the general public on a first-come, first-serve basis. Ticket holders will enjoy a formal dinner from the formidable Mi Pasión menu as well as a full complement of musical entertainment, live comedy and an outdoor beverage kiosk. Guests will also have an opportunity to browse for gifts, clothing and accessories being offered by several exclusive partners who represent the spirit of elegance and charm Rodríguez Arago wants Mi Pasión to reflect. “I’m so excited to announce our partnership with some really amazing vendors, artisans, media platforms and special event producers who are joining us as co-hosts,” says Rodríguez Arago. Among the team she has assembled to help her design an unforgettable launch party are: Amaré Magazine, a fashion and lifestyle publication founded by stylist George Rojas alongside co-owners Peter Madrigal, an actor/producer as well as star of the hit Bravo series Vanderpump Rules and magazine CEO Levis Nacaj, who also serves as the magazine's editor; Stolen Spirits, a craft-distilled rum maker from New Zealand; Gorgeous Goddess Jewelry, a boutique accessory line owned by Rojas; Hairo, a designer hair gel company started by Madrigal; Rubies & Pearls, an online fashion and retail store operated by sisters Lin and Pearl Ortiz; Creative Planners Group, a City Terrace-based event production and photo booth rental company established by Hirad Shams and Adrian Gonzalez; and Up N Smoke, a gourmet hot sauce brand created by popular taco chef and caterer Jimmy Borunda, now heading the business in Miami while associate Omar González runs the LA operations. The Mi Pasión “Grand Opening” celebration will take place on May 7th from 5 p.m. to 9:30 p.m. For more information or inquire about ticket availability, call (626) 676-8308.